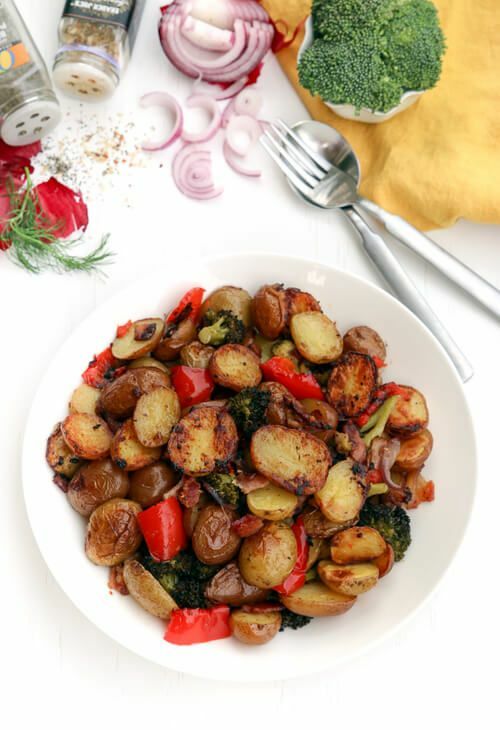 Slice each little potato in half and add to an oven safe casserole dish. Cut 1/2 broccoli, add to potatoes. Slice or chop 1/2 red onion, 1 red bell pepper and 4 slices of turkey bacon; add all to potatoes. Mix all with 1 Tablespoon seasoning, 1 Tablespoon salt and 2 Tablespoon extra virgin olive oil. Roast uncovered on middle rack for 40minutes. Give a good toss halfway through roasting.